The thing with God’s Green Earth is that when it is night time in half the world, the other side is still rocking on. But things like these are only trivial for fans of Vampire Academy who all convened at the launch of the theatrical trailer and boy was it GOOD!! Check out the trailer below in FULL HD! And we move to the fridge – part of the opening sequence in the book. Soon we are whisked away to the beautiful backdrop of Montana, the setting for the Academy. The gorgeous, regal Lissa Dragomir and guys, the cat is too cute – but it is looking right at US! Here is the Academy you guys, the beautiful Charterhouse School in Surrey and damn it looks magical! Flocking to the Church at night, the lighting is freaking amazing! THE GUARDIAN TRAINING STUFF LOOKS EPIC. AND ON A NOCTURNAL SCHEDULE. FEEEEELS. WHOA! VIKTOR …. What happened to you? From Jesse trying to have his way, to Dimitri’s *SWOOOOON* gaze, Mason’s fighting skills to Aaron’s puppy dog eyes and Christian stealing the spotlight …. it’s going to be a busy film! ROSE HATHAWAY, LADIES AND GENTLEMEN! So, Rose is one of a kind … her lines from the trailer are witty, her expressions are fierce and her passion (while dancing with Jesse or lusting with Dimitri) are OFF THE CHARTS! ALSO YOU GUYS … THE LINE “So I heard you can take two guys at once” IS FROM THE BOOK!!!! Contrary to popular belief, Dimitri can be found lurking around throughout the trailer! The still of Christian on the ground trying to use fire looks like its from the climax scenes. SO FREAKING HAPPY ABOUT THESE PSI-HOUNDS! GUYS – WE GOT THE PSI-HOUNDS! OKAY! Notice Rose’s eyes? They are glazed over – she is inside Lissa’s Head!!!!! OMG you guys, SHIZZ is going down in Vampire Academy! We’d already seen some action sequences in the first teaser, and this trailer brought us a whole lot more! Can you feel your pulse getting fast?! OMG LIKE ZOMG! I mean … look at the reaction this screencap of Dimitri Belikov got!! AND BAM …. 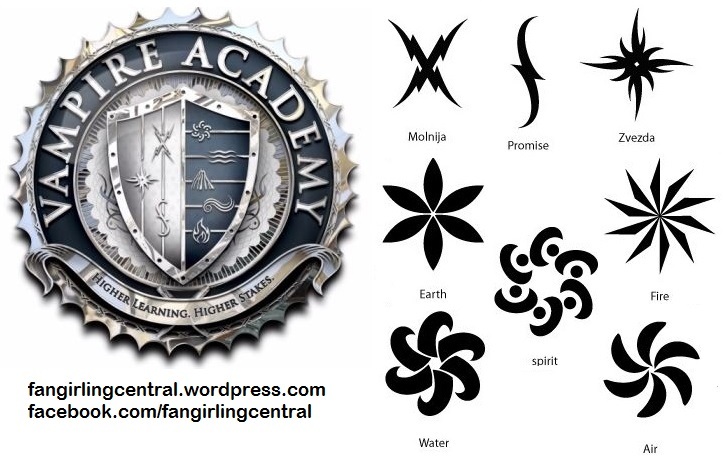 That is Vampire Academy … the first one! Set in a high school, with hot boys, mean girls, and BEST FRIENDS FOREVER! Add to that hot Russian mentor, a crazy supernatural world, all the action and mystery … and we are set for the most EPIC YA adaptation of 2014!! You guys … I want the film out NOW, but our wait is less than three months, so maybe I’ll hang on! What did you all think of the trailer? This entry was posted in Trailer Reactions, Vampire Academy and tagged Horror, Mark Waters, Richelle Mead, Sarah Hyland, trailer, Vampire, Vampire Academy, Zoey Deutch. We’ve had set visits, the first Fiery Heart book trailer (with the second one to come in a few days’ time), a new official poster, cast interviews and appearances (Comic Con)… It’s been one exciting week for sure. HOLY MOROI. I can’t even. How am I breathing I just OMG. So… Yeah. I’m totally handling all of these feels in a cool and collected manner. Mm-hmm. Just… Excuse me while I die from fangirling too much. We will definitely be decoding the entire thing sometime this week, so be sure to check back with us again soon! This entry was posted in Bloodlines Series, Book Adaptations, Richelle Mead, Vampire Academy, Vampire Academy Series and tagged bloodlines, Dominic Sherwood, New York Comic Con, official, Richelle Mead, trailer, Twitter, Vampire, Vampire Academy, Zoey Deutch. To the Old Vampires and the New! Tonight, the “older” vampires return in a new show while our beloved “newer” vampires return in the old show! The fifth season of The Vampire Diaries starts tonight and a long list of questions remain to be answered. These of course include the fate of Katherine, trapped in this world as a human; Stefan, trapped underwater in a metal safe; Bonnie, trapped in the underworld as a ghost and our resident vampires, hybrids and humans, trapped in Mystic Falls as bait! Not to mention the newcomers … do we have running bets on how long they will last? Well, we can keep guessing the fate of the new comers and how long Silas will go undetected with Stefan’s face, but we are surely HUNGRY for everything on The Vampire Diaries as they prepare for college and a new life sans any threat from the originals, but with new threats from everywhere else! Check out this gallery of arty promotional photos for this season, released exclusively on the show’s Facebook page. Here are some more cast shots for season 5. Check out the promo for this season …. WTF is happening! Is that Silas flirting with Elena … no, it can’t be, that must be Katherine getting scrubbed after her harrowing summer as a human, who it seems is flirting back with Silas, perhaps thinking him to be Stefan!? And did Damon find out that Stefan is Silas’ doppleganger … Damon, you will have to learn how to spell that word! WE.CANNOT.WAIT!!! Noticeably missing from the Season 5 roster are previous regulars Joseph Morgan, Claire Holt and Daniel Gillies who along with The Vampire Diaries recurring alum Phoebe Tonkin join Charles Michael Davis, Daniella Pineda, Danielle Campbell and Leah Pipes in the new spin-off The Originals, premiering right after The Vampire Diaries! Check out the cast below, in their New Orleans setting! We watched the backdoor pilot to the show back in season 4 of The Vampire Diaries, where we learned that Klaus’ protege Marcel now runs New Orleans and has a tight reign over the witches of the town. Further, we also found out that Hayley was expecting a child after a bedtime tryst with Klaus and the prospect of being a part of a family was enough to convince Elijah to abandon Katherine and run over to New Orleans, with Rebekah in tow after some convincing. The episode (and the show), while based around the premise of a pregnancy, still looked darker, and felt more gothic and grown up and it is certainly recommended that you tune in, because come on, can you really resist Klaus and Elijah? Watch an extended preview and a recap of the backdoor pilot, below! Each year, the CW releases some fantastic arty promotional photos, and this year is no different. You’ve seen the awesome promo photos for The Vampire Diaries above, now check out the promo photos for The Originals below, released on the show’s Facebook page! Will you be tuning in? What are you most looking forward to? This entry was posted in Television Shows, The Originals, The Vampire Diaries and tagged Daniel Gillies, ian somerhalder, Joseph Morgan, Nina Dobrev, Paul Wesley, The Originals, The Vampire Diaries, Vampire. Vampire Academy Trailer THIS MONTH! THIS CALLS FOR SOME MAJOR FANGIRLING. Okay, so The Weinstein Company (The U.S. distributor for the Vampire Academy: Blood Sisters feature film) have released some exciting new information. Are you still there? Are you breathing?! @SAEnglard asked TWC about stills, and they replied that we “might just be getting a TRAILER”… THIS MONTH! And then stills to follow! How AWESOME is that?! A trailer. This month. Imagine if it’s released when TMI comes out. My heart will explode, as I’m sure yours will too! AND don’t forget the second chapter of The Fiery Heart will also be released sometime in August. Eeeeeek!! This entry was posted in Vampire Academy and tagged Mark Waters, Richelle Mead, Sarah Hyland, stills, trailer, Vampire, Vampire Academy, Weinstein Company. Official Vampire Academy Poster Revealed! Prepare To Be Tested Dhampirs and Morois, Registration to St. Vladimir’s Begins in 2014!! 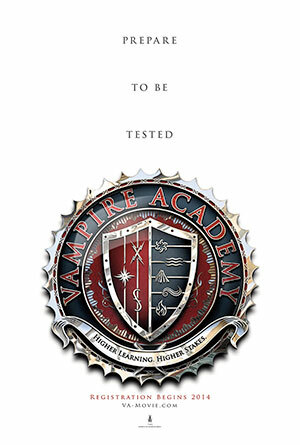 The official teaser poster for “Vampire Academy: Blood Sisters” arrived today, July 22, 2013 with the launch of the official website – http://www.va-movie.com/ and an animation showing a crest with the Promise, Molnija and Zvezda marks for the Dhampir Guardians and Air, Earth, Water, Fire and Spirit symbols for Morois on it. The silver crest had the words “Vampire Academy” and “Higher Learning, Higher Stakes” on it! The animation has to be the coolest thing I’ve seen in a while. It brings back the dark, gothic, edgy and mysterious feel of vampires that have been canon for a long time and with the blood flowing into the crest … there is this feeling and sense of power that surrounds you. In one word, Goosebumps. In two words and a character Mind = Blown. The symbols for the elemental magic [from those created by Arcane Vault] have changed and the Promise, Molnija and Zvezda marks have been slightly modified [from those created by Arcane Vault] but match the descriptions from the books. The Arcane Vault symbols are shown on the left in the image below. And here is the final poster, in its full glory! The official poster comes only a few days after the newly set-up “Vampire Academy Movie” page [handled by the US distributors, The Weinstein Company] teased us with the following official lettering and the interlocking VA sign. We love the design of the crest, poster, the interlocking VA, and are definitely fangirling over the animation … what about you? Let us know in the comments below! Great things are coming you guys! This entry was posted in Poster Reveal, Vampire Academy and tagged Movie, Posters, Richelle Mead, Vampire, Vampire Academy.